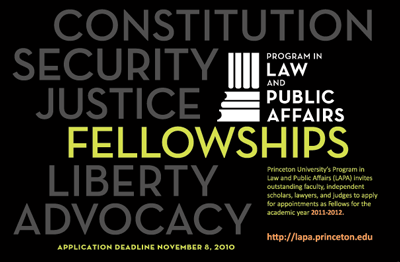 The Program in Law and Public Affairs at Princeton University, whose Director is our colleague Kim Lane Scheppele, is seeking applications from outstanding faculty, independent scholars, lawyers, and judges for up to 6 residential LAPA Fellowships to be awarded for the 2011-2012 academic year. Past Fellows include many international or comparative law scholars, including a number of IntLawGrrls' guests/alumnae: Jeannine Bell (prior posts), Mary L. Dudziak (prior posts), Fionnuala Ní Aoláin (prior posts), and Diane Orentlicher (prior posts). Successful candidates for the 2011-2012 awards will conduct substantial research on topics broadly related to legal studies. Among the Fellows will be 4 general Fellows, 1 Microsoft/LAPA Fellow specializing in intellectual property or the legal regulation of the economy, and 1 Mellon/LAPA Fellow specializing in law and the humanities. Applicants must have a doctorate, J.D., or equivalent postgraduate degree. Details and the online application form are available here. Deadline is 5 p.m. Eastern time on Monday, November 8, 2010.